When I was a Girl Scout we sang a song that involved pantomime and subtracting successive verses, replacing them with clucking noises until all that was left was a bunch of silly girls making hand motions and clucking in rhythm. “Help me, help me, help me, he said! I keep thinking about that song lately. A month ago Chad and I drove up to Columbia, Ohio, to Ways ide Lawn Structures. We needed to lay hands on, walk inside and get a feel for their prebuilt log cabins. 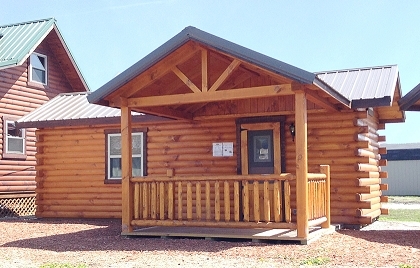 Several companies represent “Amish” prebuilt log cabins, but Wayside was the only one that we knew for certain would deliver a cabin that included wiring and plumbing. After a few hours of looking, feeling and smelling (not kidding), and peppering the manager Mark Myer with what seemed too many questions, we put down our money and ordered a cabin. I am astounded that we can have, for less than the price of a full sized sedan, a fully-finished cabin. It will come complete with cabinets, built-in queen-over-queen bunks and drawers beneath and bathroom with shower, sink and toilet. The plumbing and electrical wiring is installed. We have to make the terminations and hookups. It will rest on a gravel foundation we have installed. The cabin price, delivered to our property in Romney, WV, is about $30,000. It will cost us about $10,000 in foundation and hookups. NOT BAD. This is a Real Log Cabin, constructed of tongue in groove D-profile logs with cedar interior trim. We priced out park model RVs, and considering the same expenses for foundation and hookups, the $45 to $50K price tags made this little cabin much more attractive. When our main house is built in a year to 18 months after deliver of the cabin, we can leave it in place as a guest house, move it to another location on our property as a rental unit, sell it, or buy more land and use it for income. It’s completely portable, given the plethora of rent-to-own storage building vendors in the area. Stay tuned over the fall. I’ll post updates when the cabin arrives, and as we get it hooked up. We’re still looking for a name. Any suggestions?